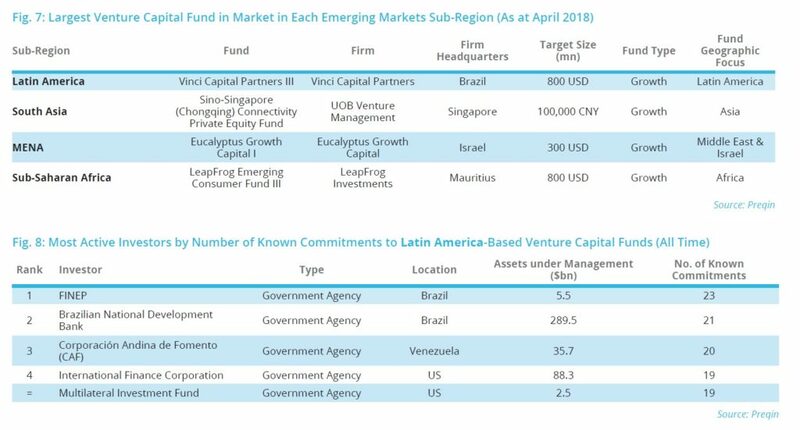 In this feature, we take a detailed look at venture capital activity in the emerging economies of Latin America, South Asia, MENA and Sub-Saharan Africa, analyzing fundraising, funds in market, deals, exits and investors in those regions. Managers located in emerging economies have closed nearly 600 venture capital funds and secured an aggregate $47bn in the past decade, yet these figures equate to only 16% and 43% of capital raised by firms based in North America and Europe, respectively. 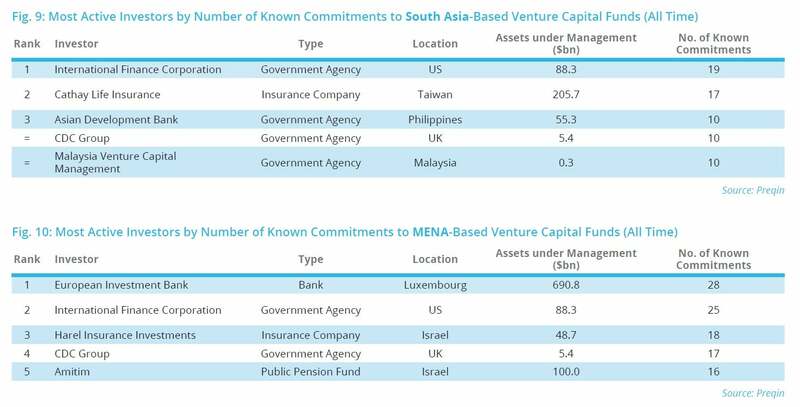 South Asia-based venture capital funds lead with the most capital ($15bn) raised of any emerging region (Fig. 1), buoyed by Singapore which accounts for 54% of funds closed and 58% ($8.6bn) of aggregate venture capital raised in South Asia since 2008. Fund managers based in MENA and Latin America have raised similar amounts of venture capital since 2008 at $12bn and $13bn respectively. Israel and Brazil lead in their respective regions, accounting for 45% and 47% of funds closed and 49% and 59% of aggregate capital raised respectively. 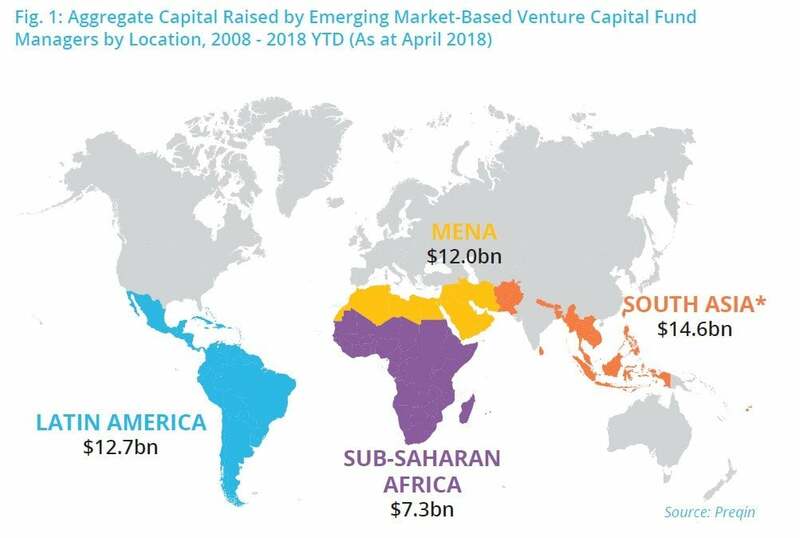 Early-stage strategies have dominated the fundraising landscape over the past 15 months in Latin America, South Asia and MENA, while growth funds have raised 50% of capital in Sub-Saharan Africa (Fig. 2). In contrast, late-stage funds did not raise any capital across Latin America, South Asia and Sub-Saharan Africa, accounting for only 13% of aggregate capital raised in MENA since the beginning of 2017. As seen in Fig. 3, when looking at the largest venture capital fund closed in each of the four sub-regions in 2017, three are early-stage vehicles, while the largest fund closed in Sub-Saharan Africa is a growth vehicle. United Arab Emirates-based Mubadala Ventures Fund I is the only top fund that will not focus on domestic investments and instead is US focused. 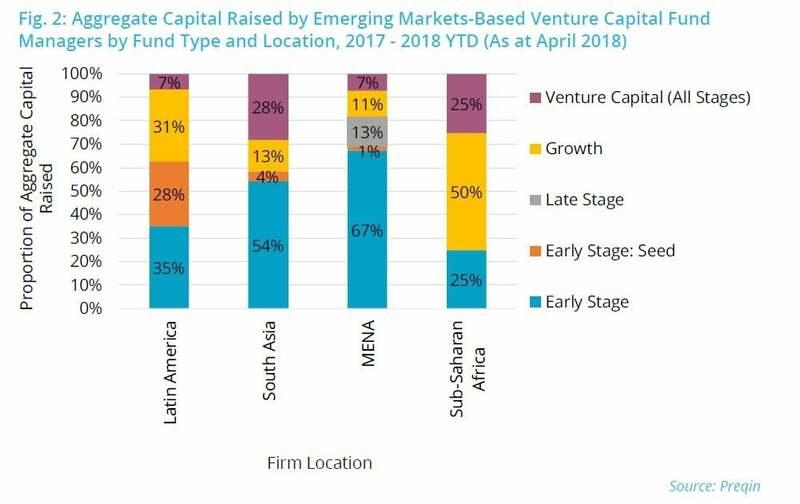 At the start of Q2 2018, 190 venture capital funds based in emerging regions are in market, with the largest proportion (30%) being raised by managers located in Latin America, followed by firms based in Sub-Saharan Africa (26%), South Asia (25%) and MENA (19%) . The largest fund in market is Singapore-based Sino-Singapore (Chongqing) Connectivity Private Equity, managed by UOB Venture Management, which is targeting CNY 100,000mn (Fig. 7). Compared to North America- and Europe-based venture capital funds, funds from emerging markets have collectively posted the strongest returns for both 2010-2012 and 2013-2015 vintage funds, as seen in Fig. 4. 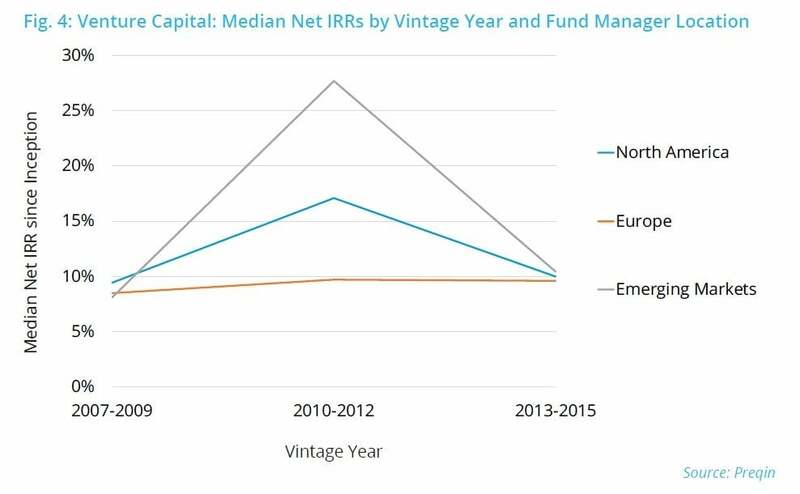 Although 2007-2009 vintage emerging market-based funds have underperformed those from North America and Europe, the median net IRR is only 1.1% and 0.4% lower in comparison respectively. Since the start of 2017, emerging markets have seen 1,168 venture capital deals valued at an aggregate $13bn (Fig. 5). South Asia accounts for the largest proportion of both the total number of deals (43%) and aggregate deal value (61%), led by the $2.0bn Series G financing of Singapore-based Grab Holdings in July 2017. When looking at exit activity in the same period, the MENA region leads with the most exits (36) and highest aggregate exit value ($1.9bn, Fig. 6). The majority (94%) of exits in the MENA region were based in Israel, led by the $580mn trade sale of Souq.com FZ-LLC. North America-based International Finance Corporation is a top investor in each emerging region, with 91 known venture capital commitments to funds operated out of emerging markets. The majority (70%) of the most active investors in emerging markets are government agencies and, interestingly, only a few are based in the same region as where they choose to invest.